The fifth icy age has descended on China–Australia relations—cooling business, frosting diplomacy and chilling strategic perspectives. China has put Australia into diplomatic ‘deep  freeze ’. China speaks of ‘a growing lack of mutual trust’ , accusing Australia of ‘systematic, irresponsible, negative remarks and comments regarding China’. Australia concedes ‘tensions’ while blaming ‘misunderstandings and mischaracterisations ’. Australia’s former ambassador to China, Geoff Raby, sees ‘incoherence’ in the way Australia is dealing with China, judging that the relationship is at its lowest since the Tiananmen Square massacre. 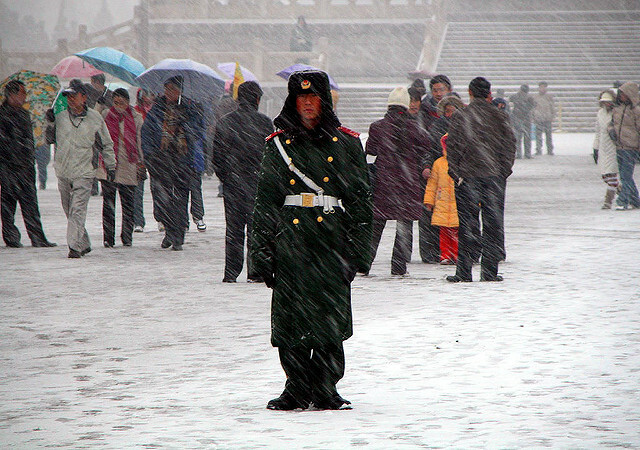 The Tiananmen reference brings us to the lessons of the four previous icy ages. The climate-change saga begins with the foundation of the Peoples Republic of China (PRC) in 1949. When China stood up, Australia turned away. First icy age (1949–1972): Siding with the US, Australia refused to give diplomatic recognition to the People’s Republic for 23 years. After long and arid coldness, the Whitlam government’s recognition of the PRC in December 1972 created an era of warm optimism. The return of a Coalition government in 1975 made the warmth bipartisan, especially as Malcolm Fraser—a pragmatic panda hugger —saw China as an ally in confronting the Soviet Union. Second icy age (1989–1991): Bob Hawke’s tears flowed after the Tiananmen Square massacre on 4 June 1989. Australia bashed at China, suspending ministerial visits, aid and loans, and stopping military contacts. The action that had the most profound effect—and turned out to be hugely beneficial—was Hawke’s decision that Chinese students and citizens in Australia didn’t have to return to China . Combined with family reunions, that saw 100,000 Chinese settle here, the biggest wave of Chinese migration  since the 19th-century gold rush. The reset during the second icy age was sharp. The Oz Sinologist and first ambassador to China, Stephen FitzGerald, said Australia had been guilty of naive euphoria about China—‘we have seemed to lose all perspective’—arguing that Tiananmen marked the end of ‘official intoxication with China’. By early in 1990, Australia’s ban on ministerial visits was lifted. China was too important to shun. The history of Australia’s relations with Asia  says the ‘hiatus in relations’ ended in 1991. Emerging from the Tiananmen pariah period, China joined APEC in 1991 simultaneously with Taiwan and Hong Kong, a moment of equivalence unimaginable today. Third icy age (1996): China put the sword to John Howard’s government, which had been elected in March 1996. Ministerial visits froze and Oz businesses in China screamed that they were being punished. The new government had offended on numerous fronts. Howard’s ministers criticised Beijing’s missile-test menacing of Taiwan . Beijing saw Howard’s call to reinvigorate the US alliance as Australia embracing a containment policy. Chinese commentators fretted that Japan and Australia were to be ‘crab claws’ gripping China. Perceived Oz sins piled up: cutting aid loans, a ministerial visit to Taiwan and Howard meeting the Dalai Lama. As Howard conceded in his memoirs, it was ‘a rocky start ’. The thaw was achieved at the 1996 APEC summit when Howard had a bilateral meeting with China’s leader, Jiang Zemin. Howard was deeply pragmatic, conceding China’s prerogatives , promising ‘mutual respect’ (respect for China’s power) and seeking to focus only on the economic relationship. It worked marvellously. The China boom lifted Australia’s boat and sailed it serenely into a golden economic era. Fourth icy age (2008–2009): Beijing thought the new Mandarin-speaking leader, Kevin Rudd (Lu Kewen), understood and loved China. Trouble was, Lu/Rudd knew China’s complexity and duality and spoke truth to power. The Rudd sharpness on China shaped the 2009 Defence White Paper . His offerings on China were bookended by significant speeches, two years apart, in Beijing and Canberra. The Beijing University speech  in April 2008, four months after taking office, was the opening, hopeful effort to dance with China. The 70th Morrison Lecture  in Canberra in April 2010, delivered two months before Rudd was cut down by caucus, showed the lingering frostbite of the fourth icy age. In Beijing, speaking in Mandarin, Rudd offered honest criticism and sought to be a zhengyou—a true friend who ‘offers unflinching advice and counsels restraint’ on contentious matters. He proposed ‘a straightforward discussion’ about ‘significant human rights problems in Tibet’. China decided it had problems with Lu Kewen. The diplomatic pressure Beijing applied to Rudd threw up a notable document: the terms of the ceasefire negotiated in the Australia–China joint statement  in October 2009. The ceasefire embraced a ‘comprehensive relationship’, acknowledged ‘differences of one type or another’ and pledged to ‘properly handle differences and sensitive issues in accordance with the principles of mutual respect, non-interference and equality’. Back then, I offered this translation of that truce language . The evidence of the last three icy ages—under Hawke, Howard and Rudd—is that today’s cold period will pass when both sides decide that enough is enough. An icy age is a diplomatic device to inflict damage and denote displeasure. Eventually, other purposes must be served. A balance between row and kow-tow will be restored. Graeme Dobell is ASPI’s Journalist Fellow. Image courtesy Flickr user Peter Morgan.